Class Act: Former Mount Gambier resident Rashidi Edward could hardly speak English when he first performed Shakespeare at Mount Gambier High School in 2011. Now as a member of the State Theatre Company’s creative ensemble, he has just completed a season performing in Macbeth at the Dunstan Playhouse. From the high school drama class to Adelaide’s Dunstan Playhouse, former Mount Gambier resident Rashidi Edward has followed his dreams into the spotlight. As an Adelaide College of the Arts graduate and now member of the State Theatre Company’s creative ensemble, the Congolese-born24-year-old is living “the dream”. Rashidi arrived in Mount Gambier with his family in September of 2010 and started his education at Mount Gambier High School shortly after. He studied English as his second language and admitted the barrier made it difficult to make friends upon arrival. It was not until the following year he was thrown a life-changing curveball when cast as Caliban in a school production of William Shakespeare’s The Tempest. For some high school students, Shakespeare’s language can be tough to grasp, but for Rashidi it was a major challenge. With only some English in his vocabulary and no knowledge of Shakespeare’s work, he was thrown in the deep end. “I did not even know who Shakespeare was,” he said. “I had not even lived in Australia for a year and my English was so bad. He said drama was his favourite class at school, but it was not until his senior year he decided to pursue acting as a career. “I really loved performing and drama class was so much fun,” Rashidi said. “In Year 12, I based my research project on acting and that was where my interest started to take shape. After chatting with teacher and actor John Crouch, Rashidi discovered a range of study options. “I had no idea you could go to school for acting and to me it sounded great, it was like a whole new world had opened up,” he said. Inspired and excited, Rashidi applied to Flinders University and the Adelaide College of the Arts. “I was really excited and nervous because I didn’t have a Plan B if I didn’t get in,” he said. “Auditioning was not as terrifying as it seems, it was actually pretty chill and everyone was so friendly. He was accepted into the three year Adelaide College of the Arts advanced diploma of acting course. Before his graduation last year, Rashidi was invited to audition for the State Theatre Company’s creative ensemble. After he impressed director Geordie Brookman at a lengthy workshop, he was offered a place in the ensemble. “I was so happy to hear the big news and for me to walk right into such an amazing gig after graduation was amazing,” Rashidi said. This year, Rashidi has performed in the State Theatre Company productions of A Doll’s House and Macbeth. Revisiting the language which perplexed him six years ago, Rashidi said he was reminded of his humble beginning when cast in Macbeth. “When we were rehearsing the show, all I was thinking about was how differently I approached the Shakespearean character this time around,” he said. “Back then I did not have a full understanding of Caliban’s complexity and how his presence affected the story. 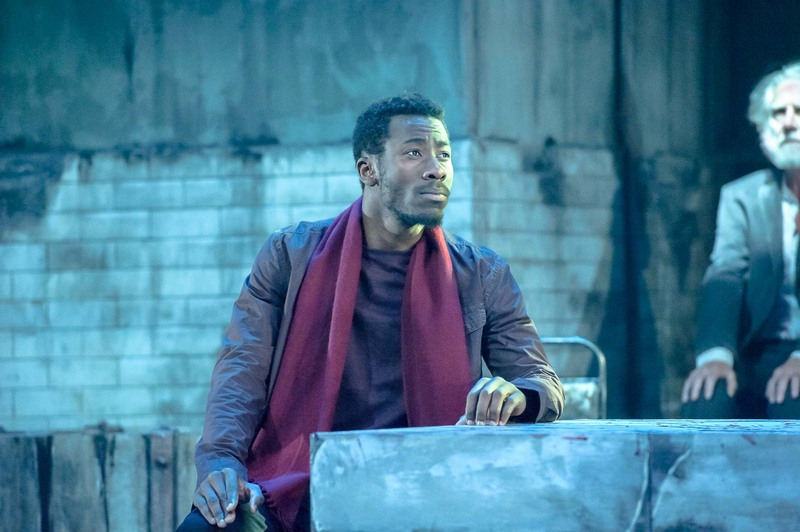 Comparing his first theatre experience with the present, Rashidi said he believed The Tempest was his best performance to date. “I just don’t think I will ever out-do it because I was so young and had no idea of the acting world, it was as if I played the role as a seven-year-old,” he said. Aside from theatre, Rashidi has appeared in the feature film Rabbit, expected to appear at the upcoming Adelaide Film Festival, on screen in Genna Chanelle Hayes’ debut Akoni, a web series titled Runaway Moon and an ABC television comedy. The company’s 2018 season will see Rashidi feature in another two productions including In The Club and Sense and Sensibility. He said he was proud of his achievements and thanked his Mount Gambier supporters. “I am very proud to have got to where I am, but it would not have been possible without my drama teachers and fellow cast members for their support,” Rashidi said. On Stage: State Theatre Company performer Rashidi Edward as Malcolm in William Shakespeare’s Macbeth on stage at Adelaide’s Dunstan Playhouse.